The assumption that working age Canadians receive health benefits through their employers is based on outdated beliefs about the labour market. Our study Low Wages, No Benefits showed that one-third of working Ontarians do not have employer-provided health benefits. 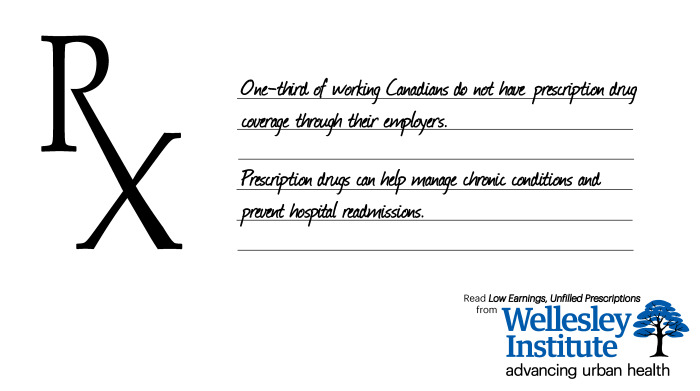 • Canada is the only country that has a universal health care system that excludes prescription drugs. The federal government should create a national PharmaCare program. Providing health care is essential but it’s only half the job. The only way to ensure access, equity and quality in prescription drug coverage in Canada is to follow the lead of every other country with a universal health care system and incorporate prescription drugs into the Canada Health Act.